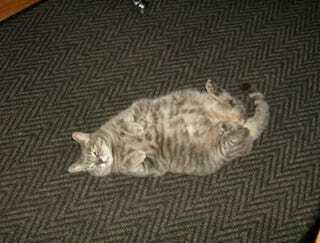 There is something about a kitteh with an exposed belly that causes an unresistable urge to rub it. See the belly, rub the belly. It's as simple as that. Even cat haters, (is there such a thing? ), feel the urge to rub. But, alas, I have no time today for my usual nonsense. Now that summer is over, I seem to be getting busier. What's up with that? Anyway, I have a post. I really do. But it's not a normal post. Nope. Not normal at all. It's a Made Up Monday post! And it's one that I'm sure all of you are familiar with. It involves our beloved kittehs. Today, I'm not coming up with the story. I'm telling you something you already know, but challenging you to determine if you've been lied to your entire life or not. Stringed instruments. Tennis rackets. They have one thing in common. Historically, they have both ben strung with....cat gut. And, that's not a euphemism. Actual guts from actual cats. Or, that's what they tell us, at least. But, is it true? You tell me today, and I'll reveal the answer tomorrow.